this weekend, I took it easy. I slept in, had no plans, and in general did things at a gloriously slow pace. I finally had the time to do the little tasks I never get to – catching up on the dishes, planning meals, dusting…and cleaning my makeup brushes. I may or may not have cleaned my brushes instead of attacking the ever-growing pile of laundry, but small steps, right? right. I believe in investing in good brushes, but good brushes doesn’t always mean expensive. in my stash, I run the gamut from very affordable wet n’ wild, sonia kashuk, sigma, eco tools, and real techniques brushes to more expensive ones from mac, sephora, and nars. 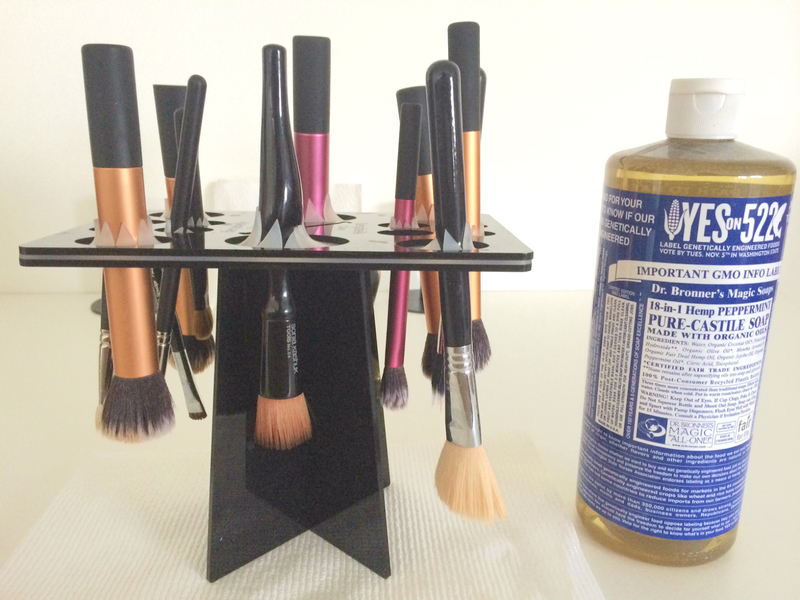 no matter what price tag, gentle and (semi)regular cleaning of your brushes is a must. what’s the point of getting good brushes if you’re not going to take care of them? I rinse my brushes in lukewarm water, plop a little bead of soap directly on to the brush, work the soap in, and then gently scrub the brush against the inside of my palm, much in the same way that you would run a brush across the back of your hand to get rid of excess product. I like doing this because I can see the product coming off for one, and because my hand is stationary and I’m moving the brush against it instead of vice-versa, I can control how gently I’m cleaning the brush. I rinse again in lukewarm water until the run-off is clear, then I gently squeeze the excess water out and gently reshape the brush to its natural shape. they then dry upside down over night, and in the morning, they’re good to go. drying them upside down is ideal because it lets any water run out away from the ferrule (the metal part clamping the hairs to the handle) and other parts of the brush that shouldn’t get wet. keep this in mind, too, when you’re rinsing – try to avoid getting the non-hairy parts overly wet. 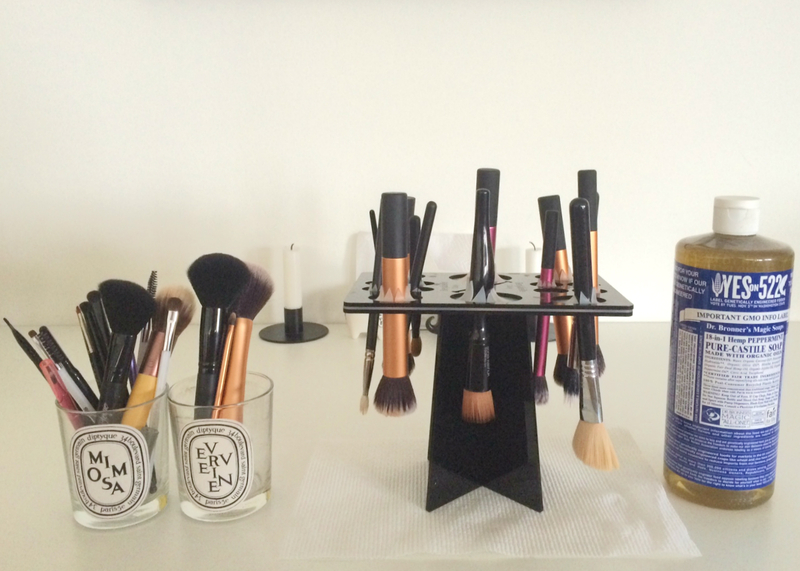 I use this drying stand which can be disassembled for easy storage and dr. bronner’s magic soap. it’s gentle, cleans really well, can be used for other cleaning purposes, and makes my brushes smell amazing.